During the month of October, the West Fargo and 25th Street Caribou Coffee locations participated in the Amy’s Blend promotion to benefit Hospice of the Red River Valley. 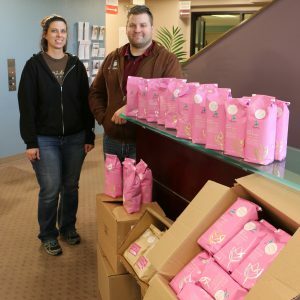 Patrons purchased and donated around 125 pounds of Amy’s Blend coffee that will be shared with Hospice patients and their families. We’ve seen the smiles this promotion brings to the faces of our patients, and we’re grateful to have been chosen by Caribou Coffee again this year!